How does KACE K2000 Systems Deployment Appliance compare? A side-by-side breakdown of the SmartDeploy imaging software and KACE K2000 image deployment appliance. SmartDeploy is software that is quickly installed and configured on nearly any IT workstation. In most scenarios, no additional infrastructure is needed. The KACE K2000 (formerly Dell KACE) is a system deployment appliance that uses proprietary file-based imaging technology for OS and application deployment. Due to the complexity of the KACE appliance and custom configuration options, extensive ramp up and training time are required to properly implement the solution. The KACE K2000 deployment appliance is a physical, or virtual, appliance that requires additional infrastructure, often resulting in higher equipment and maintenance costs. 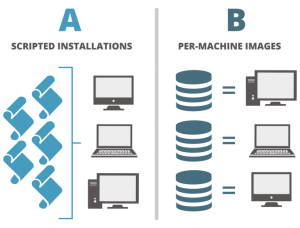 SmartDeploy allows users to manage a single image for seamless deployment to any device. Users deploy one golden image to any hardware type by utilizing SmartDeploy’s pre-built driver packages. Users save time and simplify image management tasks by eliminating time-consuming scripted installs and streamlining a large image library. Platform Packs are model-specific driver packages pre-built by SmartDeploy engineers for SmartDeploy customers. 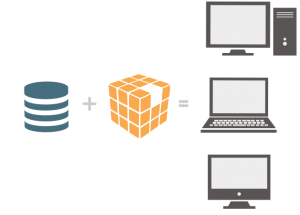 With SmartDeploy, drivers are injected at deployment time. Each device gets only the specific drivers needed and all the challenging, time-consuming work is done for you. A. Write complicated and time-consuming scripts to automate the endpoint installation process. B. Create and maintain a different image for every hardware type. KACE utilizes a repository of drivers for many different models that customers need to acquire. The deployment relies on Plug and Play (PnP) to pick the best driver from this repository. If multiple versions of a driver exist and PnP selects the wrong driver it could cause unexpected endpoint behavior, including blue screens. SmartDeploy guides users through step-by-step wizards, with built-in deployment best practices, allowing technicians of any skill level to achieve success. Since the SmartDeploy trial is fully functioning, users pick up right where they left off with their evaluation once they have purchased. Most users are up and running quickly without requiring early or ongoing training. SmartDeploy support technicians are US-based deployment experts with a 300+ level of technical expertise. A full resource library and community forum, deploycentral.com, is also available. SmartDeploy is committed to customer success and welcomes customer feedback and feature requests. KACE is a complex solution that requires a high technical skillset to fully utilize. To evaluate KACE prior to purchase, users are given access to a sandbox environment to test the solution. After purchase, implementing KACE often requires weeks of training and configuration. In most scenarios, success is best achieved when a technician is allocated specifically to learning and maintaining KACE. KACE offers tiered technical support and complex issues may take more time to resolve as users filter through the support tiers to get to a high level technician. KACE customers comment that documentation is scarce. SmartDeploy offers competitive pricing and special trade-in offers to help customers transition to SmartDeploy. In most scenarios, SmartDeploy pricing is 30-50% lower than Dell KACE K2000. With SmartDeploy, customers get started right away without requiring expensive, time-consuming ramp up training. KACE often bundles the deployment appliance, licensing, support, and new user training. Additional appliances may be required for environments with multiple locations.